A good chocolate cake is a great crowd pleaser!! This chocolate almond cake combines the richness of dark chocolate, whipped egg whites and ground almonds to create a light fudge consistency that will bring smiles all round! I created this recipe as a dessert on The Reset retreat I catered for recently. This was my first time catering for such an occasion and knew I would be under time pressure. I made this Chocolate Almond Cake first thing in the morning, allowed it to cool and stored it in an airtight container at room temperature until required later in the day. 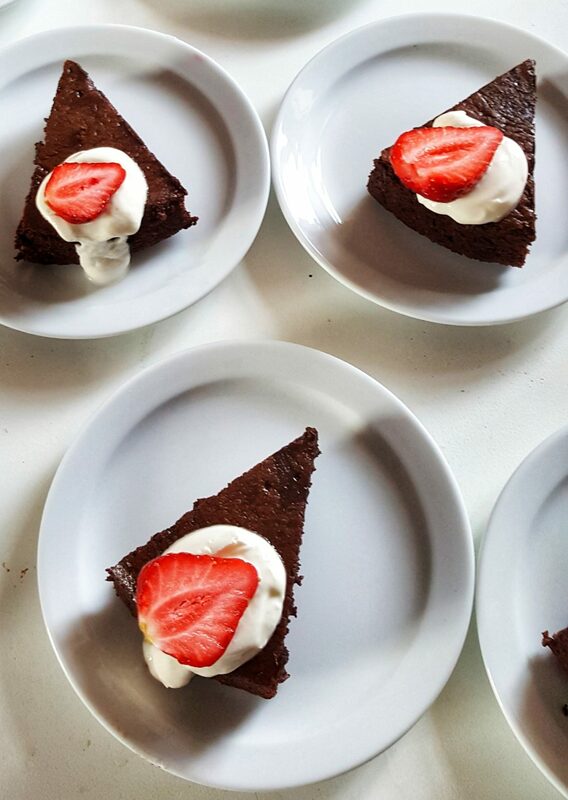 Chocolate cakes are rich so nothing more than a dollop of Greek yoghurt and some fresh seasonal fruit is required when serving. Line the bottom of a 15cm round springform tin with baking parchment. Grease the sides of the tin lightly with butter or oil. Melt the chocolate and butter in a heatproof bowl over a saucepan of simmering water. Once melted, remove from the heat and stir through the sugar (reserve 3 tablespoons for the egg whites) until dissolved. Whisk the egg yolks through the chocolate mix. Beat the egg whites with an electric hand-held beater until semi-stiff peaks form. Add in the reserved sugar and continue to beat until stiff peaks form. Fold 1 tablespoon egg whites followed by 1 tablespoon almonds into the chocolate. Continue this process until a glossy surface is formed. Pour the mixture into the prepared tin. Gently tap the base of the tin on the worktop to allow any air bubbles release. Bake in the oven for 55-60 minutes or until firm on top when you press the centre and a skewer comes out clean. Allow to cool in the tin on a wire rack. Once cooled, run a knife around the edge of the cake before releasing the springform catch. Serve with seasonal berries and a dollop of Greek-style yoghurt.